Use our free passport photo online service to print passport photos on standard sized photos. Our app will enable you to print between 2 and 6 passport pictures per standard photo. Cut the passport photos on the cutting lines to the correct size. You can then print passport photo pictures at any place that prints standard photos for a fraction of the cost. You do not need a passport size photo. 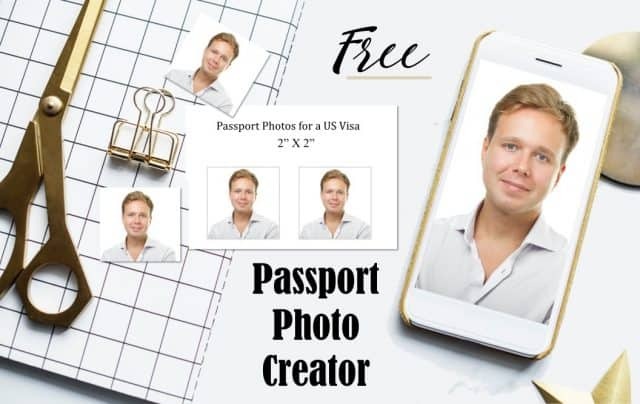 Our free passport photo maker will take regular photos and resize them to the correct size. Passport Photos are usually required with a visa or passport application. The photo needs to be fairly recent (not older than 6 months). Take a photo of each person according to the following instructions. Insert each photo into the passport photo editor by clicking on “add your photo here”. Download the photo and have it printed at 4” x 6”. It must be printed on photo quality paper and in color. The background must be white or a very light color. Your head must face the camera directly so that your full face is in view. You must have a neutral facial expression or a natural smile. Both eyes must be open without glasses. No hat or head covering unless it is for religious purposes. If so, it cannot obscure your face or cast shadows. Disclaimer: Every effort has been made to enable you to print a passport photo with the required size via our passport photo cropper but we cannot be responsible if the size is not accurate. Please ensure that the photo is printed at 6″ and 4″. Measure the cropped photo before you cut it and ensure that you cut it to the correct size. Please leave a comment if you have any problems.